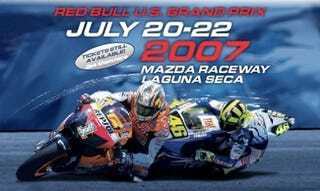 We've shed two wheels for the weekend and spirited northward from the Jalopnik Los Angeles compound to California's Mazda Raceway Laguna Seca to catch the 2007 Red Bull US Grand Prix. We spent yesterday sampling two of Ducati's latest — a Monster 695 and a Sport1000 Monoposto, the company's throwback sportbike — on some of Bumbeck's favorite haunts like State Route 154. We also dodged landscape trucks on the 101 and hippie vans on the coast highway, following a risky stop for Oxacan food in San Luis Obispo and an encounter with some portly creatures of the deep near Big Sur. Difficulty level: A-ok. Now we're listening to the latest round of MotoGP free-practice sessions and stuffing ourselves with double espressos and Jimmie Dean food products. We'll be here all weekend, catching the latest chapter in Casey Stoner's rise to stardom, Valentino Rossi's slog back to superstardom and Nicky Hayden's bid to make Kentucky the new Motegi. Catch our field reports on the MotoGP tag or RSS feed.